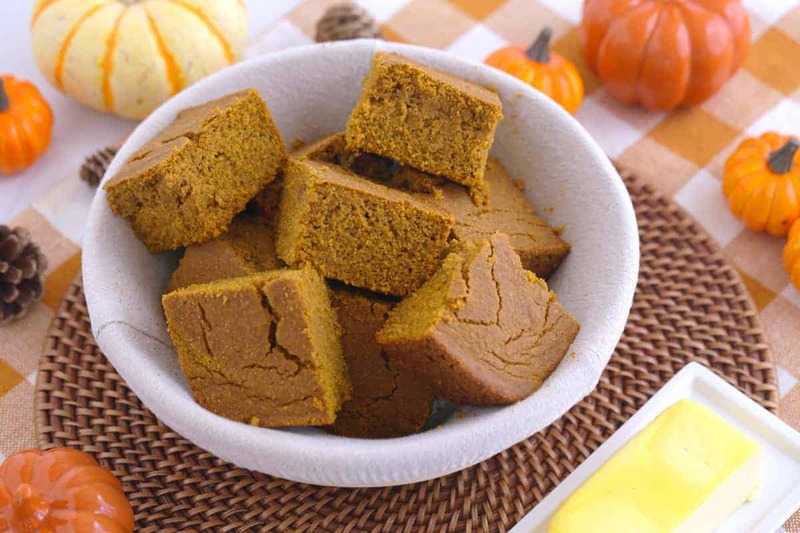 Pumpkin Cornbread – Healthy Side Dish for Thanksgiving! When savory cornbread meets sweet pumpkin, you’ve got a holiday treat that can’t be beat! This pumpkin cornbread has just a hint of creamy sweetness from the pumpkin puree, which also helps to keep the texture nice and moist. But, if you’re a cornbread purist, don’t worry. Even though I’ve lightened up this pumpkin cornbread recipe, it still has the savory comfort and fluffy texture of a classic cornbread! A crave-able, healthy Thanksgiving side dish that everyone is sure to love. And, it’s totally gluten-free! The base of this batter is still cornmeal, just combined with the whole grain goodness of oat flour. Actually, I think the oat flour makes this pumpkin cornbread even more indulgently fluffy! Plus, it adds a nice nutritional boost and packs in more satiating fiber. In just one piece of pumpkin cornbread, there are 4g of dietary fiber—along with a whopping 5g of protein! And, the natural sweetness and sugars in the pumpkin puree helps cut down on the additional sugar needed in this recipe. Of course, I just want more of that delicious pumpkin flavor in my holiday meal. But, pumpkin puree also adds to the fiber content and packs over 50% of your recommended daily vitamin A into each piece of pumpkin cornbread! Fluffy, comforting, and filling, this healthy Thanksgiving side dish will satisfy your taste buds and your hunger. For even more festive indulgence, I recommend enjoying this pumpkin cornbread warm with some corn butter! Craving healthier holiday recipes like this? Find TONS more in my 150+ Healthy Holiday Recipes eBook! In a bowl, combine oat flour, cornmeal, spices, salt, and baking powder. Whisk to combine. To a separate bowl, add pumpkin puree, eggs, milk, coconut sugar, and molasses and mix well. Add the dry ingredients into the wet and beat well with a hand mixer. Spray down an 8×8-inch glass baking dish with cooking spray. Pour batter into dish and smooth out the top. Bake about 30 minutes, until a toothpick comes out clean. Yields 9 pieces of pumpkin cornbread (depending on size of cut).